Hi, I am Dr. Thorne and this is my sandbox. Here, I'll be putting my work-in-process SCP objects and you are more than welcome to give me criticism, suggestions, feedback or help. SCP objects I have yet to write! Special Containment Procedures: SCP-1XXX is to be stored in a standard containment locker at Site-19 unless currently used for testing. SCP-1XXX should be kept away from any bed or other object constructed for the purpose of rest, as it displays a short area of effect within which its anomalous properties may manifest given the necessary conditions and activation is essentially uncontrollable. 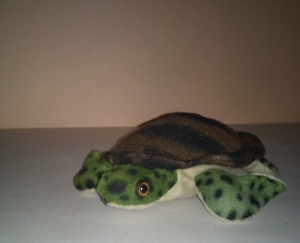 Description: SCP-1XXX is a plush toy in the shape of a sea turtle, constructed out of fleece and stuffed with cotton. The right eye of the object is missing, with tears in the material suggesting it was torn or bitten off. The remaining eye is composed of rubber and plastic, and is attached via a small plastic peg inside the head of the object. Materials display no unusual traits. When inert, SCP-1XXX is by all means an ordinary plush toy. SCP-1XXX's anomalous properties only show when it is located within a three (3) metre reach of a human subject currently sleeping in an appropriate location and in possession of some sort of cover big enough to conceal their entire body, such as a blanket or bedsheets. When these criteria are met, SCP-1XXX will activate and immediately transport to a location where it makes physical contact with the sleeping subject. Subject making contact with SCP-1XXX will invariably move into a foetal position while concealing themselves and SCP-1XXX under the cover. If this process is not hindered, the subject and SCP-1XXX will appear to rapidly sink into the material underneath them and seemingly disappear. Removing the cover from the subject at any stage of the process will interrupt it, but the subject will attempt to regain the cover if it is still in their vicinity. In addition, SCP-1XXX will only move to subjects sleeping in beds or couches. Moving SCP-1XXX from the subject will result in it relocating to the subject unless they are outside of its reach within five (5) seconds. After five (5) to eleven (11) hours has passed, the subject and SCP-1XXX will return to their previous location and the subject wakes up within sixty (60) seconds of their re-emergence. To date, every subject that returned report sleeping heavily during their absence, and were not aware they had been missing. Addendum: SCP-1XXX-1: During a testing session D-8548, who had entered a coma after exposure to SCP-███, was introduced to SCP-1XXX. While D-8548 was not able to move on his own, SCP-1XXX's process continued as normal after an additional blanket was used to conceal D-8548. After twelve (12) hours, SCP-1XXX re-emergenced without D-8548, who has not yet been located. Dr. Thorne: Good morning, D-8549. Did you sleep well? D-8549: Guess I did, why? Dr. Thorne: I'm just doing some psychological evaluation, did you experience anything unusual last night? D-8549: Did you do something to me while I was asleep or something? Dr. Thorne: Not at all, now please answer my question. D-8549: Right. …I guess- when I think about it, I had this dream. D-8549: It was like… You know when you're underwater, and you can't see anything? D-8549: I was underwater, and it was pitch-black. Well, mostly, anyway. There was light, somewhere in some direction. I flailed my arms like a fool, trying to reach it, I just sunk. Nothing I did helped. D-8549: The whole thing was so real, too! I just flailed desperately as the light grew more distant, feeling everything go numb as my lungs filled with water and I waited for my death. But NOTHING happened! I was locked in this agony as my entire body whispered desperately for air and my mind begged for a release that never came. D-8549: And then I woke up, thankfully. Dr. Thorne: I think we're pretty much done here. Thank you for your time and be sure to report any more unusual dreams. Special Containment Procedures: Due to the nature of SCP-XXXX, no effort is required in its containment. Its movement are to be tracked at all times by the Guardian, a Foundation-owned remotely operated underwater vehicle. Messages left by SCP-XXXX are to be recorded and then erased to reduce the possibility of public knowledge. Description: SCP-XXXX is a humanoid being located at the bottom of the Mariana Trench. 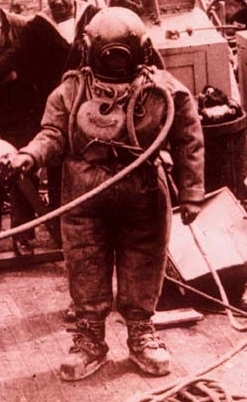 SCP-XXXX wears a standard diving dress showing signs of damage identical to those caused by prolonged exposure to water. The suit does not seem to have an internal or external oxygen source, and the means by which SCP-XXXX remains alive despite of this is unknown. One (1) standard-sized black leather couch. Four (4) blankets of various sizes. Three (3) dog bowls, two for food and one for water. One (1) large pet bed. A total of six (6) dog toys of various shapes and materials. SCP-1105-A and SCP-1105-B are to be fed trice a day using everyday dog food and the water bowl is to be refilled simultaneously. Treats are to be readily at hand and given out as a reward for good behaviour. Researchers not tasked with feeding or performing tests on SCP-1105 are not allowed access to the cell. Monthly examinations are to be carried out by any available researcher with sufficient knowledge as a veterinarian. 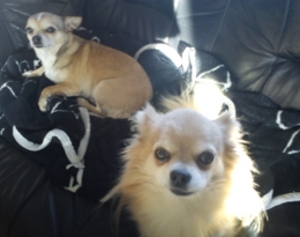 Description: SCP-1105 collectively refers to two canines of the breed Chihuahua, known as SCP-1105-A and SCP-1105-B respectively. SCP-1105-A is female with creme-coloured, short coat. SCP-1105-A is slightly overweight, at 3.5 kg but is otherwise healthy. It responds to the name "Vera" but is wary of SCP personnel save a few researcher it considers friendly. SCP-1105-A has a scar on its stomach, indicating a caesarean has been performed on it in the past. SCP-1105-B is male with a long coat of the colour blue fawn, weighting 2.9 kg and showing no signs of health issues. SCP-1105-B responds to "Eustace" and is significantly more friendly than SCP-1105-A, and will wait at the cell door when it hears someone entering. Physical examinations has shown that SCP-1105-B has been neutered at some point in the past. Physical examinations have established that both SCP-1105-A and SCP-1105-B are 6 years old. Despite a need for sustenance, neither one of SCP-1105 produce waste. SCP-1105 emit a strong perception-altering effect to anyone within a range of 3 m. Human beings within this range will visually and audibly perceive any human outside of this area as a Canis lupus familiaris, more commonly known as the domestic dog. Upon leaving the effected area, the subject will see and hear others as normal again. If two (2) or more individuals stand into the area of effect, they will perceive each other as normal. This effect extends beyond living individuals, as even photos, recordings and [REDACTED] of humans are changed into dogs. It is not known if other animals are effected by this but guessing by their bodily language, SCP-1105 does not seem to be subjected to this effect. If someone stands within the area of effect of both SCP-1105-A and SCP-1105-B simultaneously, one more anomaly is produced in that the subject will perceive SCP-1105 as regular humans. SCP-1105-A is seen as an elderly woman with a stout build and white curly hair, while SCP-1105-B is seen as an tall and lean man in his older years with balding hair and a horseshoe moustache. Both of them appear to be of Hispanic heritage and wear common clothing from the year 1950. While SCP-1105 are seen this way, the subject can hold conversations with them. SCP-1105-A speaks Spanish and limited English, while SCP-1105-B speaks Spanish and English fluently, albeit with a heavy Mexican accent. Individuals outside of the area of effect do not hear SCP-1105 talking. SCP-1105-A has been described as cold, but wise and motherly, while SCP-1105-B has been described as energetic and amiable, but absent-minded. The possibility of an interview with SCP-1105-A and SCP-1105-B is under consideration. Discovery: SCP-1105 was found in the home of the late [REDACTED] both of who had died in their home due to natural causes. SCP-1105 was discovered by an acquaintance of the late owner, a Mr. P████, who alarmed the Foundation when he called the police and yelled how the streets were full of dogs. Agent J███████ went to the scene to collect SCP-1105 after interviewing Mr. P████, who mentioned that the late [REDACTED] had never owned a dog in their lives. Everyone related to the incident was given class B amnesiacs and SCP-1105 was taken to the Foundation for study. A being that feeds on positive emotion aimed towards it. How am I supposed to write that scientifically? Needless to say, this one needs to be finished, grammar needs to be checked, a bit of rewording and lastly I want to bump of the creepy-factor a bit. I'll be trying to emphasis the fact that this thing is not human and see if I can get some kind of uncanny valley reaction on it. Also the containment procedures need to be rewritten, as I realized they were far too tame. Description: SCP-1420 is a being that resembles an androgynous child with snow-white skin. Length is estimated at 109 cm and weight is around 27 kg, however 10 kg of that weight is caused by a 254 cm long, black material sprouting from SCP-1420’s head. While this material looks and behaves like hair it displays great resilience to any kind of damage and any attempt to remove a strand for study has proven futile, along with SCP-1420 showing signs of distress. SCP-1420 has the ability to form a symbiotic relationship with human beings. It does so by singling out anyone who stays in its presence for an extended period of time, seemingly studying them. If SCP-1420 is allowed to study its target in this manner for approximately 10 minutes, SCP-1420 will start following them in an affectionate manner akin to a child’s attachment to a parental figure or a sibling. In addition, it starts displaying the personality and behaviour the target would find most appealing. If the target accepts SCP-1420’s presence, they will become its host. Should the target choose to ignore SCP-1420, it will start looking for another host. Being separated from the host for 3 hours will break the connection between SCP-1420 and the current host. The company of SCP-1420 appears to be an extremely positive influence on the host, as they show signs of relaxation along with increased motivation and a blissful attitude. These are ideas I want to write, but haven't quite gotten around to yet. Bullet Countdown: A drawing with the number 9 on it that counts down to 1 before restarting, with the speed of about one cycle per 19 hours. Every time it hits 1, a random firearm anywhere on earth is fired. Destroying the drawing causes it to appear on a piece of paper somewhere else, this time counting down at double the previous speed. To date it has been destroyed between █ to ██ times. The Man In The Photo: A middle-aged man who retroactively appears in photos long after they have been taken.